This is a formatted report that is ready for printing (PDF). It includes optional time data and a custom date range. 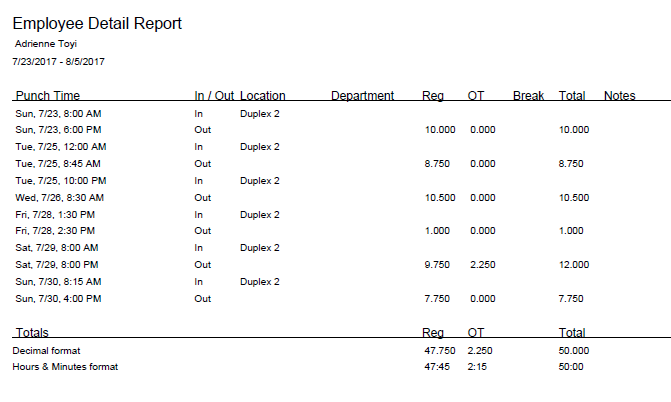 To access this report go to Reports --> Employee Detail Report. From here you can filter by Employee, Location, Department and Position if scheduling is enabled. You also have the option to decide how the list is sorted, whether by first name/last name or last name/first name. When ready you can run the report, view and export. The report will look like the following (below). This report runs for all employees and is a PDF per employee.